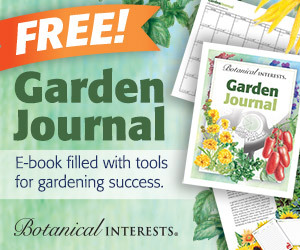 Looking for a few new ideas for growing fresh herbs this year? Need a little inspiration to get you started? You have come to the right place. Here are 10 fun ways you can incorporate kitchen herbs into any landscape or home. Do you have Limited Garden Space & want a Weekend Project? A great herb garden idea for small yards is to build an herb spiral. An herb spiral is a structure that can be built to contain all of your herbs in a relatively compact growing space. The beauty of the spiral is you can plant herbs that prefer different growing conditions in the same space. Mediterranean herbs that love the sun and drier conditions are placed near the top. While herbs requiring more moisture or shade are positioned at the bottom and eastern sides. The photo to the right is of a relatively small spiral. Of course, you can also make it as big as you like, many grand homes include an herb spiral as part of their landscape design. No Garden Area at all? Try a Container Herb Garden. Another herb garden idea is to create a potted herb garden. 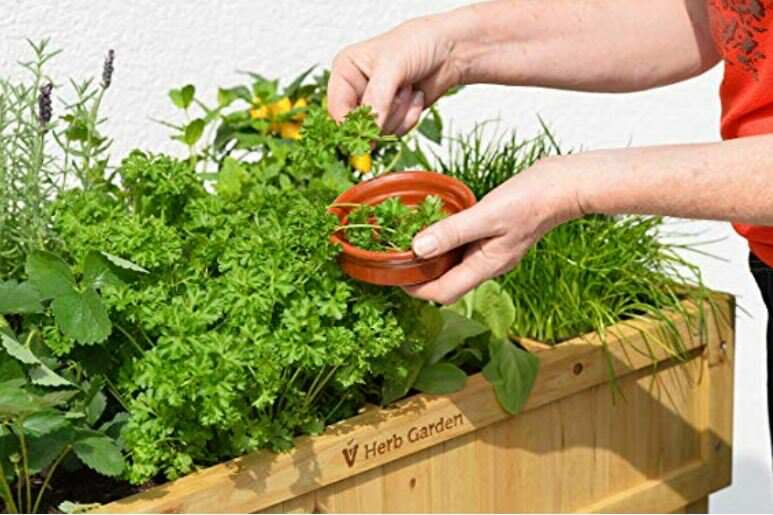 If you think this idea is for you, don’t miss our article on growing herbs in pots that provide the growing tips to keep your herb pots healthy. This is an extremely flexible way to grow your favorite culinary herbs and keep them close to the kitchen door. You can ensure that each herb has plenty of room to grow. This will also allow you to move the pots to different locations as needed. For example, when an herb is flowering you may want to move it to a showcase location, perhaps near a walkway where you can appreciate the blooms & fragrance. Or if you have a single plant that is not getting enough sun, you can move it to a brighter spot. During each herb’s peak harvest season, you may want to move the pot closer to the house to make sure you don’t forget to pick your herbs while they are at their freshest. Another way to design your container herb garden is to combine the herbs pots with a few flowers. This increases the visual appeal and allows you to bring more color to your herb garden. This is also a great way to fill the pots when your herbs are still young. Some great flowers to include in your herb pots include violas, pansies or marigolds. Sweet peas and nasturtiums are also two great choices which will drape over the side of the herb pots creating a beautiful display. You can create a pretty combined planting in a large planter on your deck or patio. The rolling planter pictured here is a cool idea since it can be moved to allow your plants to get more sun or if you’re just sweeping up the porch. This large planter is made from Butcher block cedar and measures four-feet long which big enough to plant several types of veggies, herbs, and flowers. Growing herbs in pots can be a fun way to bring some color or texture into your landscape by using different types of pots and planters even if you do have plenty of room in your garden. Prefer to keep your Culinary Herbs in the Kitchen? A perfect idea for beginners is to create an indoor kitchen herb garden and grow several of your favorite herbs on the window sill. You can set up a windowsill herb garden in an afternoon and start cooking right away. Even in the colder months, you can normally find some fresh potted herbs for sale in grocery stores or specialty markets. Basil, parsley, cilantro and thyme are some of the more common herbs sold in markets. Why not create a mini herb garden using these Recycled Grow Bottles? This inventive design uses recycled wine bottles to create a small hydroponic grow system right in your kitchen. The bottles are 8 inches high, so can be placed on the counter next to a window so your herbs receive good light. This is a nice way to be kind to the earth while you grow your own herbs. Plus since the herbs are grown using hydroponics, there is no messy soil to dirty up your kitchen. The one shown to the right is available on Etsy from the seller Potting Shed Creations. You can find it here ==>> Basil Grow Bottle. If you don’t have enough light in your kitchen, try one of these Smart Herb Gardens by Click and Grow. This is a hands-off system that takes care of your plants for you. You can use the Basil cartridges that come with the system or refill it with your own favorite herb plants. These herb garden kits have a self-controlled system that gives your plant all the water, air and nutrients it needs to thrive. All you have to do is plug it into an outlet and fill the water tank about once a month. A great system for the busy cook, beginners or anyone that enjoys fresh herbs year round. The last on our indoor list is an herb garden kit. Perfect for DIYers, this a kit that comes with 3 rustic ceramic planters, growing medium, plant markers and herb seeds (Basil, Chives, and Sage). This is another great hostess gift or easy way to get started growing culinary herbs. All three varieties grow well indoors and add a delightful fragrance to the kitchen garden. The window sill suction cup shelf is an inventive way to mount the herb planters, especially if your window sills are not wide enough for an indoor garden. They offer a low profile and can be placed in just the right sunny spot. Herb plants thrive when grown outdoors in the fresh air and sunshine. Do you have an Existing Flower Garden? You can reserve a corner of your garden exclusively for herbs or you can intersperse them within your flower gardens. Raised garden beds make it even easier to create set up a growing space for herbs. Herbs are beneficial to grow in the flower garden. They can discourage pests and attract beneficial insects such as ladybugs and praying mantis to your garden. Did you know oregano is an excellent herb for deterring garden pests? And that basil can help deter flies that may be drawn to holly plants? Do you grow Vegetables? 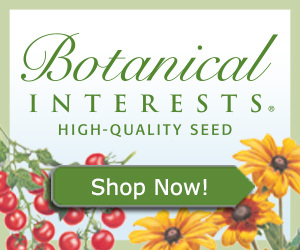 Try Companion Planting. Culinary herbs make wonderful companion plants to many vegetables improving their flavor and warding off unwanted pests. Basil is perfect growing next to your tomatoes and peppers. Dill is a good companion for lettuce, onions or cucumbers. Mint should be planted under melons to increase their flavor. Chives will repel aphids from your tomatoes and carrots and rosemary will help keep the beetles away from your beans. Often the combinations that taste good together are also helpful to grow together. The gardener’s at Yates have created this handy companion planting chart for vegetables and herbs. This is a great chart to see which herbs are most beneficial in the vegetable garden. Like the idea of a Small Kitchen Garden, but don’t have room Indoors? Another easy herb garden idea is a windowsill planter that hangs on the outside of your windows. Since the planter is set up to hang right outside the window, the herbs get plenty of sunshine. Setting up a window sill planter is a great weekend project that can be accomplished with just a few tools and some hardware. They also provide a nice design element to the exterior of your home. You would be surprised how a few little touches like this can really improve your curb appeal. Self-watering windowsill planters can make maintenance even easier. Don’t like to get dirty? Try Hydroponics. A fun way to grow herbs at home is to create a hydroponic herb garden. Hydroponic herb gardens are the best way to grow a large number of herbs indoors quickly. The concept of hydroponics in it’s simplest terms is growing plants without soil. Instead of soil, the plants are grown in a unique combination of water and nutrients. Some systems also use a sterile growing medium such as coconut fiber, gravel or even sand. There are many different types of hydroponic systems that can be used to grow herbs ranging from small countertop designs to larger outdoor setups. The photo to the right is an excellent example of a vertical hydroponic herb garden. This is perfect for an outdoor garden where space is at a premium. A similar version is made by the appropriately named brand Mr. Stacky. You can grow herbs using the traditional growing medium of soil or hydroponics using this planter. There are many different ways to set up a hydroponic herb garden system. If you are handy and like DIY projects, you can build your own hydroponic system with materials from the local hardware store. Or if you prefer a ready-made solution, you can purchase a tabletop system, like the AeroGarden and grow fresh herbs in your kitchen. Are your Windowsills too narrow to support an Herb Garden? Many homes today do not have wide enough window sills to support several herb pots. 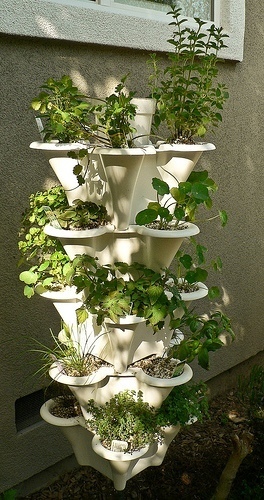 Inventive garden companies have designed a solution for this problem – vertical and hanging herb garden planters. You can set an herb garden on any wall that receives a good bit of sun. The planter shown in the picture is a set of 3 terra cotta pots framed by a rustic chicken wire pot holder. The wood comes in a few different stains so you can match it to your decor. This planter is available on Etsy. You can find it here ==>> Set of 3 Rustic Hanging Wall Planters. It would look great in a country style kitchen! The design is flexible enough to use indoors or outdoors. Hang just one planter or combine several to create a custom wall design. Create a kitchen herb garden planter with just a few of your favorite herbs. You can plant three or four varieties together in a large planter. This way you will only have a single location to maintain. Select a few herbs which grow well together. Here are 3 good combinations for beginners that will grow well together in the same planter. You can also purchase an herb garden kit which comes with everything you need to create your own herb garden. Check out our article on gardening gift ideas to find some additional recommendations that are well suited for the herb gardener. Are you a Beginner & not sure how to get started? Why not start with fresh cut herbs from the grocery store? You can create a mini kitchen herb garden by storing herbs like thyme, rosemary or sage in small bottles of water. Keeping your herbs this way can actually make them last for several weeks or more. Here’s how to create a beginner herb garden with supplies from your local grocer. Select the freshest herbs you can find. Remove them from their packaging & discard any bruised stems. Fill a small bottle or glass with water. Trim the leaves from the bottom of the cut herbs so no leaves will be sitting in water. Place the herbs in a small bottle or glass of water. Set the glass or bottles on the window sill exposed to indirect light. This is a truly beautiful way to store herbs where you can appreciate them every day. They will also keep you inspired to cook fresh healthy meals or provide a gentle reminder to add a pretty garnish of herbs to your dish. Whichever method you choose, creating a kitchen herb garden is a great way to bring your cooking to a whole new level. Need more kitchen herb garden ideas? Head on over to the small herb garden design page to get some additional inspiration.